Beer makers throughout New Mexico are fashioning up a varied, and delicious, selection of hand-crafted brews. These microbrews are among the best in America, with breweries across the state just waiting to be tried. The brew masters at each of these spots have mastered how to create distinctive flavors out of a few simple ingredients. Here are the 11 best breweries in the state! There’s a sign on the outdoor bar at this half-acre beer garden that says, Garden of Dreams—If you brew it they will come. With 14 different beers on tap, as well as hand-crafted sodas, they do come by the barrel full! The brewery has two brands under its name: The namesake Sierra Blanca and Rio Grande. The full-service tasting room is open Monday through Saturday and serves everything from its signature ale to pilsner to lager to IPA to cerveza to stout. Check out the food truck on the weekend that serves specialty sandwiches. Unfiltered, unconventional and unleashed is the owner’s approach to beer making. You’ll find a variety of beers on tap on any given week. Try the tasting flight to savor each of them. Also available by the pint or get a growler to go. The Milk Stout, a roasty blend of 10 different grains has a unique flavor that’s hard to beat. There’s a number of ales including brown, amber, cream and India Pale. Free peanuts and popcorn with every beer, or pair any of them with the traditional pub food on hand for a great evening out. A cooperatively run brewery and taproom with a membership that has a say in how both are operated and insists on the highest quality, fresh, handmade craft beer. Membership brings with it discounts on retail beer purchases, merchandise, education classes, beer dinners and additional specials throughout the year. Popular beers include a selection of pales, American-styled blonds, pilsners, and pale ales. Dark beer aficionados will appreciate the range of offerings. Food on hand comes from the Los Alamos Co-op Market or bring your own from your favorite spot. Sustainable brewing practices are the driving force behind this small nano-brewery. They pride themselves on using local and organic food and alternative energy. They have gardens, bee hives and chickens at the Bernalillo location which has a two-barrel system that produces eight great beers. They use the highest quality ingredients to ensure they stay true to their brewing style of making tasty, handcrafted micro beer. They live by their motto: Balanced Beer and Balanced Life. Great atmosphere, great beer, great people. That’s the talk on the street about this small local micro-brewery in the Cavern City. The handcrafted beer is brewed on the premises. Order a flight sample and get a taste before you commit to a pint. Order a growler and take your favorite like the mole stout, German wheat beer or IPA, home. Indoor, as well as outdoor patio seating. Live entertainment weekly. The brewery partners with regional food trucks that serve everything from pizza to tacos to Caribbean cuisine. The owners of Blue Heron took their passion for home brewing to the next level when they opened this brewery. The first 100 gallons they made are long gone but they’ve re-placed them with a sizable selection of pale ales to stout to porters and pilsners. The brewery and tasting room, closed on Tuesday, is in Embudo and the taproom, which serves light fare, is located on the historic plaza of Espanola and is closed on Monday. This small family-owned microbrewery high, you might find snow if you go, in the San-gre de Cristo Mountains was the winner of the “Best Brewery” and “Best Beer” at the Red River Oktoberfest last year. It might be because they use the pure mountain waters in their unique take on their small-batch beer-making process. Even with only four taps at the tasting room, they rotate their beer, including local favorite the Golden Aspen Ok-toberfest, throughout the year so there’s always a good variety. Their outdoor patio is open Wednesday through Sunday … snow or shine. A variety of craft beers brewed in classic style is what’s on tap here at the downtown restaurant and tasting room. 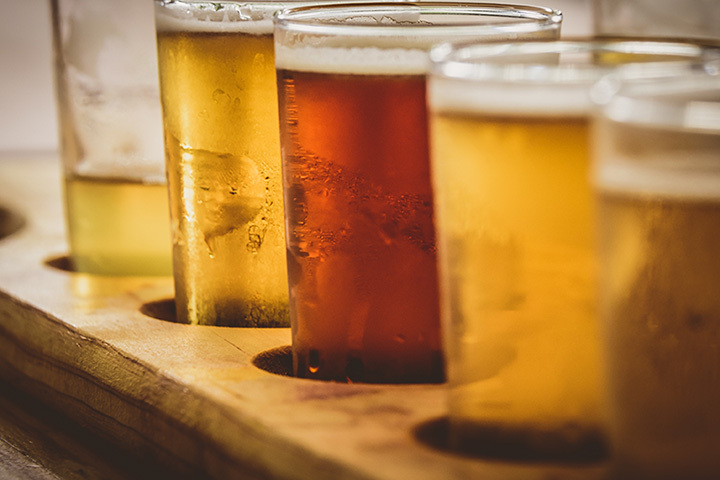 You’ll find a rotating selection of their own handcrafted beers—blonde ale, amber ale, pale ale, New Mexico brown and a porter—in addition to seasonal offerings. A move in 2013 from the original location in Sapillo Valley brought the operation to downtown Silver City. Open for lunch and dinner with a wide-ranging menu of pub food, plus burgers, wraps and vegetarian options. The city’s historic downtown area is home to both the brewery’s restaurant and tap room where you can sample 12 of their handcrafted beers on tap at all times. There’s always a tap set aside for dark beer lovers ranging from stouts to porters to browns. Imperial beers have a special tap and there are two taps designated just for seasonal choices. The restaurant menu is extensive, plus they serve brick oven pizza—the perfect beer food. Only here would you find the motto, “Made with Care & Prayer.” Beer making is done by the monks at the Benedictine Monastery of Christ in the Desert, the first monastery in America to incorporate the 1300-year-old European tradition of monastic brewing. Hops are grown on the grounds and used in the brewing of the Monk’s Reserve Ales. Currently, the product line features five distinctive award-winning handcrafted ales served on tap only. The Monk’s Tap Room in Albuquerque showcases these fine beers. A small, independently owned farmhouse-style brewery and farm gastropub. That means they make really good handcrafted beer and high quality food! The specialty is sour ales, an intentional choice in the beer making process. The beer maker creates that taste through a mixed-culture fermentation process and then ages the beer in oak vessels. A favorite is the Agent Scully, an IPA that uses organic unmalted Sonoran white wheat, Amarillo and Simcoe hops and some ginger marmalade. The menu is inventive: Lamb meatballs, pork belly, marrow and favorites like mac ’n cheese and chicken and waffles. View more New Mexico Breweries and Brew Pubs.